The HORTILED Multi has been specially developed for lighting crops that are grown in several layers, growth chambers, air-conditioned containers, tissue cultivation and research situations. Multi is the ideal LED fixture for multi-layer cultivation and dimmable experimental set-ups and delivers the highest efficiency on the market. Efficiency levels of up to 2.5 µmol/J can be achieved, depending on the light spectrum. This makes the HORTILED Multi 60% more energy-efficient than fluorescent lighting. The HORTILED Multi is available in 2 lengths: 120 cm and 150 cm. Both formats can be supplied with an 80° or 150° beam, enabling you to choose between outstanding uniformity and good light penetration into the crop. You can select the ideal beam to suit your set-up and the crop. 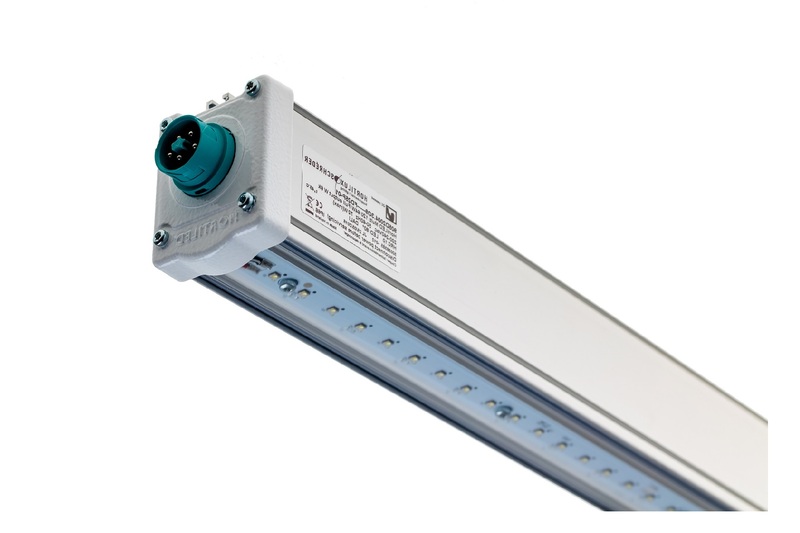 The HORTILED Multi is available in two light output versions: low and full output. The low output version (from 50 µmol/m2s) is normally used in situations with a restricted height. Full output is the best choice in situations where a high light intensity is needed (intensity up to 1500 µmol/m2s is possible). Overall, full output gives the highest µmol/Joule output of all comparable products on the market. The HORTILED Multi can be supplied with a wide range of colour spectra. The right colour spectrum and optimum configuration in each fixture are determined by the crop, the set-up and the specific crop/colour spectrum requirement. A customised colour spectrum can be developed at project level. Each HORTILED Multi fixture can be supplied with one light colour or a combination of colours. If you choose one colour per fixture, dimming of each light colour is available as an option. The colour spectrum, light intensity and lighting time can be controlled using the specially developed HORTILED Dimcontroller. This is a handy Dali module with a touchscreen which allows the colour spectrum to be adjusted very easily in 5% increments (from 5 to 100%) to suit any conceivable situation. The HORTILED Multi is a very handy fixture which is easy to install thanks to an integrated, pluggable 230 V connection within the fixture. The dimmable fixtures have a 5-pole Wieland connector and the non-dimmable fixtures have a 3-pole Wieland connector.